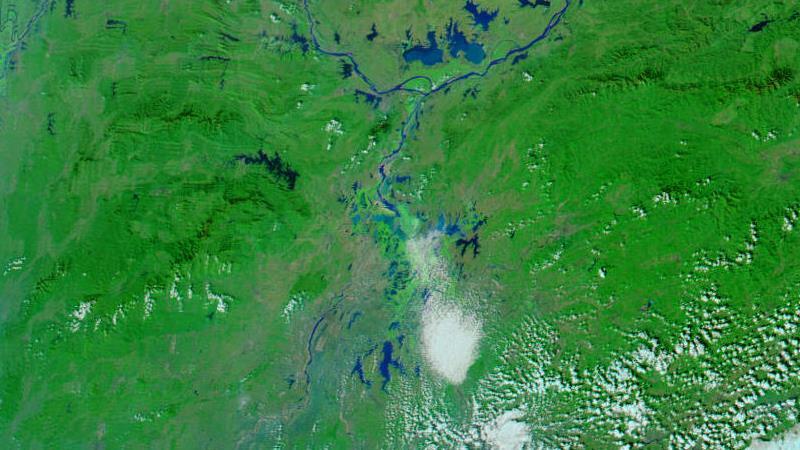 Satellite image of Poyang Lake on November 15, the day after the lake’s water level fell below eight meters. NASA image courtesy LANCE MODIS Rapid Response Team at NASA GSFC. The troubles of Poyang Lake, China’s largest freshwater lake, are getting drowned out by the clamor generated by the superstorms Typhoon Haiyan and Cyclone Phailin. A crisis is still a crisis, however, even if it is not punctuated by 150mph winds and catastrophic flooding. The problem is, Poyang’s waters are receding earlier in the season now. The local government reported that the lake now enters its dry season more than seven weeks earlier than it did in the second half of the 20th century. The region receives 60 percent less precipitation, and the lake’s water level is reaching a historic low. More than a million people have suffered drinking water shortages as a result this autumn, and the lake’s fishing industry has literally been grounded. Poyang Lake is the focus of my latest post for National Geographic; to read more please visit: http://on.natgeo.com/19IZ8RG. This entry was posted in Agriculture, Climate Change, Reporting, Water, Writings and tagged Agriculture, China, crane, dam, Dan Klotz, International Crane Foundation, Jiangxi, migration, Poyang, Siberian, Warsaw, Water, wetlands by klotzian. Bookmark the permalink.